The Department of Environmental and Occupational Health invites you to a lecture on "HUMAN CHRONOBIOLOGY: internal time, social jetlag, and health" by Till Roenneberg. College of Public Health - University of the Philippines Manila in partnership with the Department of Social Welfare and Development conducted the "Leadership for Convergence Training Program for the Department of Social Welfare and Development's City and Municipal Action Team Leaders. Held at CPH Annex II - August 18-19, 2016. 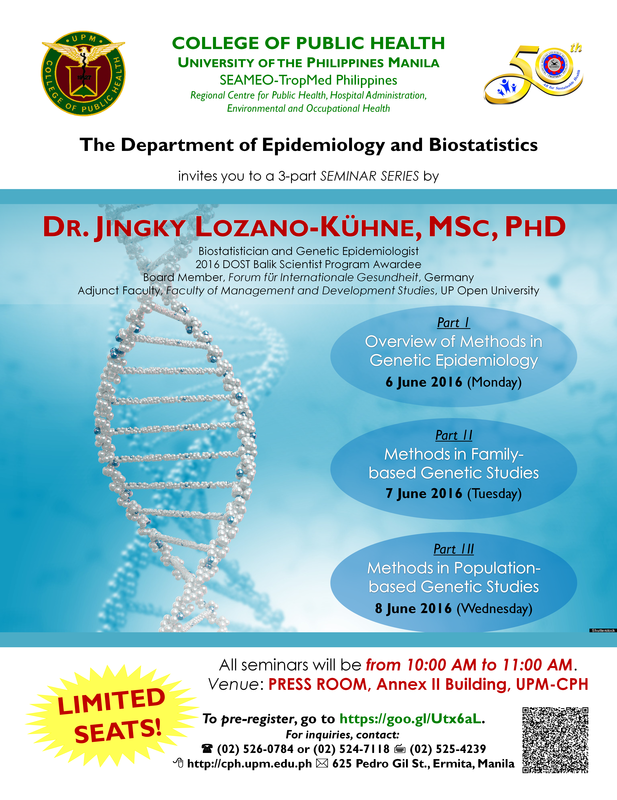 The Department of Epidemiology and Biostatistics invites you to a 3-part Seminar Series by Dr. Jingky Lozano-Kuhne, MSc, PhD on June 6-8, 2016 at UPM-CPH Annex II Building.